There is something so sweet, and comforting about familiar traditions-am I right? Growing up my Mom had one on our birthday. 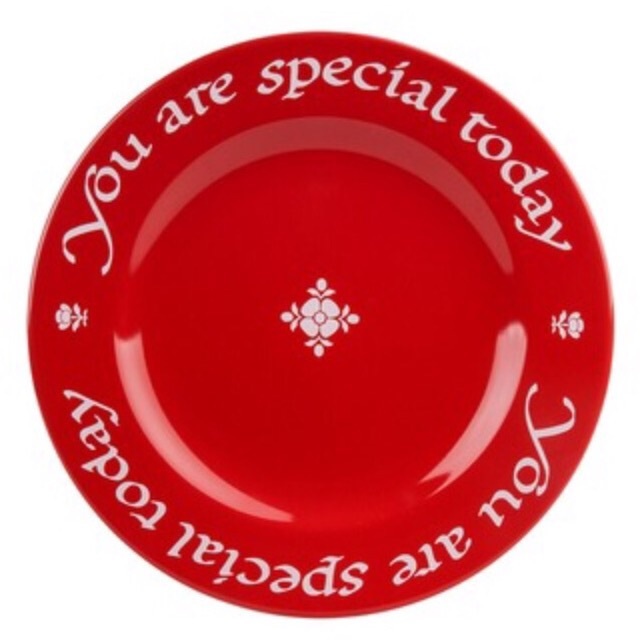 Every year we would eat all day on the birthday plate, embossed with the words "You Are Special Today". We always laughed at that plate when we were kids, thinking it was a silly gesture. Yet when I became an adult I realized the value of celebrating people, who they are, what they bring into the world. Many years ago I purchased a plate of my own. Now anyone in our home who has a birthday will get to eat on the special plate, just like I did as a child. I plan to take it a step further, bringing the plate out for random moments when I feel like my kids need an extra boost of encouragement. Their lives are valued, and I want them to feel loved and celebrated always. If a plate can help with that I'm all for it. They can laugh at Mom's "silly plate" when they're little, but one day when they're older I think they'll realize just how special it really was. There are many places you can purchase the plate, but I got mine from Overstock (with a coupon of course, always a coupon). Note: It is made of glass and very sturdy. I hand wash mine, just to take extra care of it. Newer PostQuestion: Do You Have a Favorite Inspirational Verse/Quote?